The home of Barbara and Len Eaton at 841 Beswick Way was purchased in 2011. The house was remodeled extensively, and a year later they had their daughter-in-law Kelly Eaton design the landscape plans. 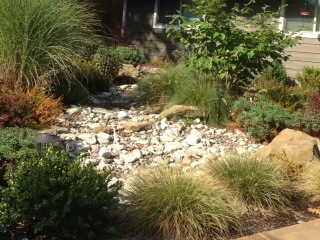 Barbara requested that Kelly use native plants and grasses to provide habitat for bees, butterflies and birds. They had two oaks and a small madrone in front, and the few tall pines in the back that were the backbone of the garden. Some grading was done, the paths and structures put in and the drip irrigation and dry cree k bed Installed. The front was done first with many native tall and short grasses, manzanita, echinacea and an orange witch hazel next to the dry creek bed. 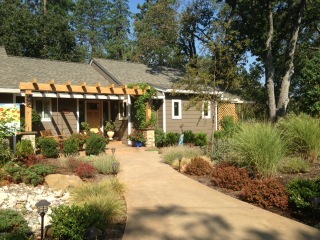 In addition, a royal purple smoke tree and a crepe myrtle grow on the right side of the walkway. 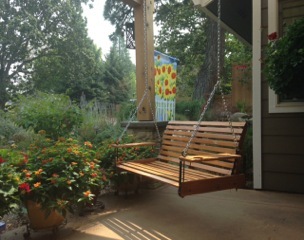 The wood arbor at the entrance has an Akebia vine which will shade the lovely swing from which you can sit and view Grizzly Peak. Star Jasmine climb the screens on the right. The large pots, overflowing with bright orange lantana and red geraniums, give a happy welcome to visitors. Walking down the driveway you can look up and see the bee hive in the oak. Kelly put in a few plants that have drip only to preserve the oaks. When you enter the back gate you will be met with a lovely cascade of hardy geraniums, alyssum, yellow lantana, a family fuchsia and a pink crepe myrtle. Lizzy the family dog sits on the stairs to greet you and lead you into a path that takes you to the center three-tiered fountain. When you look to the back garden there is a very large wood-beamed arbor with a wisteria that will shade the right side. In the center is a fireplace. Again Barbara has filled some large pots with blue black salvia and more lantana which the bees are feasting on. To the right and down behind the garage are raised vegetable beds that produce a variety of tomatoes, string beans and pumpkins. The garage wall has a large espaliered Star Magnolia and two pot stands filled with cascading Creeping Charlie and Creeping Jenny. Under the towering pines is a Cherokee Chief dogwood and a flagstone pathway which has Blue Star Creeper and flowering thyme covered with many happy bees. Another lime- leaf smoke tree and a yellow witch hazel complete the path. The city of Ashland did audits for water use and fire safety which passed, with the City even putting photos of the garden on their website. This garden was on the garden to ur of the AAUW in 2014. Len has a shop where he will be building the gate to their own piece of paradise. He also mows the lawns and helps with the fall cleanup while Barbara maintains the gardens. They have achieved their desire for a habitat that keeps the bees, birds and butterflies happy and “at the end of the day” they both enjoy sitting in the swing and looking up at Grizzly Peak. 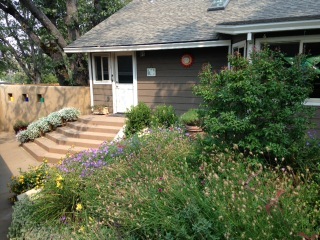 The garden at 973 C Street, owned by John Price and Erin Keller, was a blank site following the home’s construction in 2009. The next year, retaining walls and fences were built, with plantings beginning shortly thereafter – all designed and built by the owners. Passing through a beautiful front gate leading into the garden, past dahlias and zinnias, one can see vine covered arbors. These add interest and dimension to an ordinary lot. Two of the arbors are covered in two species of Kiwi. 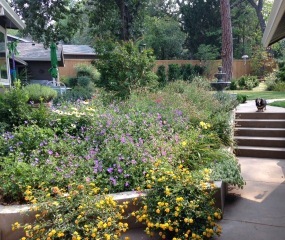 In addition to peach, pear, plum, fig, and apple trees, the garden also features Rudbeckia laciniata, hazelnut, honeysuckle, and Cornelian Cherry. A blueberry hedge growing along the east fence was successfully planted over a buried wood swale. This has proven beneficial in helping the soil retain much needed moisture. In fact, permaculture principals dominated much of the design, with beauty, food production, and privacy playing a key role. I think you’ll agree John and Erin have succeeded and have provided the community with a lovely example of what can be done with a simple, empty space.